College life is not a class schedule. 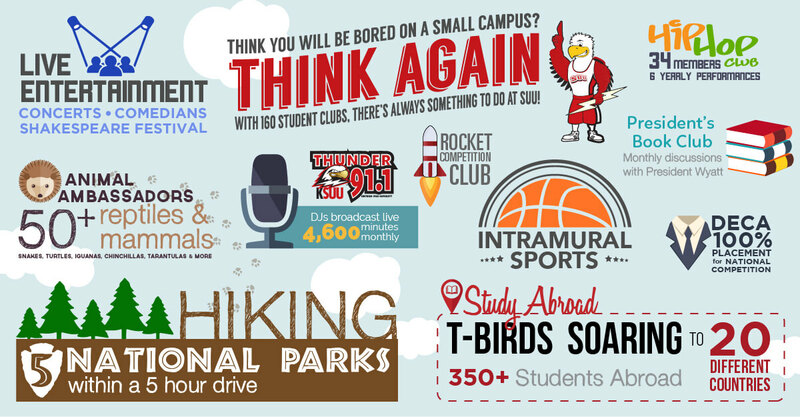 SUU offers something fun for everyone. From clubs to concerts to athletic events and outdoor adventure, students enjoy a full-spectrum of collegiate experience. Touting the world’s best backyard, SUU lies in proximity to the largest concentration of national parks and monuments in the nation. There is plenty to see and do in this red rock wonderland where students have adventures in national and state parks through SUU's Outdoor Center. What's more, SUU's residential campus keeps more than 90 percent of students within walking distance, so there's always a friend nearby to join in the fun.